Now, for the first time, see how the Dominion War affected the entirety of the Star Trek universe. From the heart of the Federation to the bridge of the Starship Enterprise. From the front lines of Klingon space to the darkest recesses of the Romulan Empire. From the heroic members of the Starfleet Corps of Engineers to the former crew of the U.S.S. Stargazer. From the edge of the New Frontier to the corridors of station Deep Space 9. This book owes its existence to Star Trek: Deep Space Nine for two reasons. The obvious reason is that the Dominion War was chronicled on the last two seasons of DS9. That show introduced the Dominion, the Jem'Hadar, the Vorta, and the Founders, and many of the stories you are about to read relate to episodes of DS9, either by expanding on references in them or chronicling events that happened simultaneously with them. But the second reason is far more fundamental than that: when DS9 debuted in 1993, it changed the face of Star Trek forever. Until DS9 came along, Star Trek was pretty much defined by the words spoken at the beginning of one of the most famous show-opening voiceovers in television history: "These are the voyages of the Starship Enterprise." It could be Kirk's Enterprise or Picard's Enterprise (or, if you wanted to get radical, possibly Pike's Enterprise, April's Enterprise, or Garrett's Enterprise), but for twenty-seven years, it was the Enterprise that was always at the forefront of most any Star Trek adventure. Then in January 1993, DS9 debuted, taking place on a space station, featuring a cast that was only about half Starfleet -- and the floodgates opened. Now, the whole Star Trek universe was fair game. Star Trek was no longer limited to one ship. The storytelling possibilities, already pretty wide with a ship of exploration at its center, got even wider. This extended not only to television, but also to the Star Trek novels, which have been, in one form or other, an integral part of the franchise since Mission to Horatius was published back in 1968. In 1997, Star Trek: New Frontier debuted, with Peter David chronicling the adventures of an all-new ship and crew created just for the novels -- something that wouldn't have been imaginable before DS9. The success of New Frontier in turn led to more prose-only projects: Star Trek: Stargazer by Michael Jan Friedman, showcasing a young Jean-Luc Picard in his first command three decades prior to Star Trek: The Next Generation; Star Trek: S.C.E., a monthly series of eBooks by a variety of authors featuring the Starfleet Corps of Engineers; and my own Star Trek: I.K.S. Gorkon, focusing on a vessel in the Klingon Defense Force. "This," you may say, "is all well and good, but what does it have to do with this anthology?" A fair question. 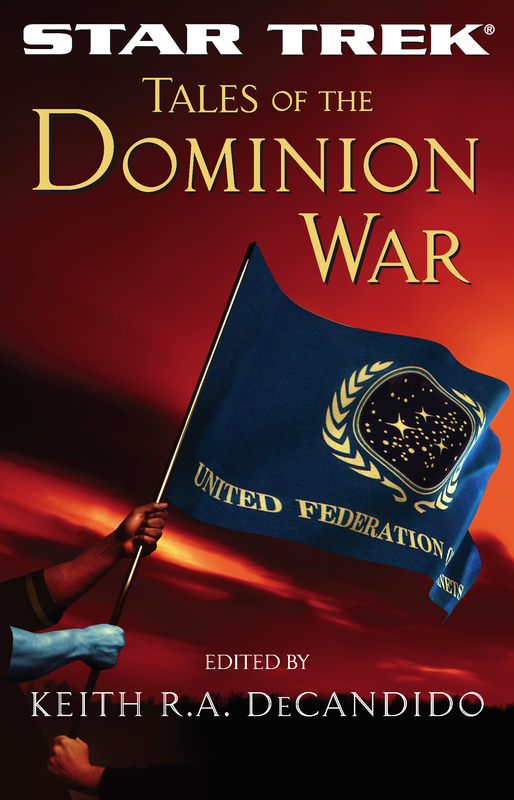 The Dominion War was a massive endeavor, one that involved the Federation, the Klingons, the Romulans, the Cardassians, the Dominion, and so much more. But DS9 was really only able to show a small portion of it. Just as MASH showed the Korean War through the lens of one particular group of characters and one general location, DS9 likewise gave us a view of the Dominion War. But it's not the complete picture of the whole conflict. That's where Tales of the Dominion War comes in. I love the opening up of the Star Trek universe because I love to explore all the nooks and crannies, the roads not traveled as often, expanding on the bits that are talked about but not shown. With the war, I found myself asking many questions. Some previous novels and eBooks had dealt with the conflict to some degree or other (see the timeline at the back of this volume), but I was still left wondering: What was Picard's Enterprise doing? What about the original series characters Spock, McCoy, and Scotty, all of whom are still alive and kicking in the late twenty-fourth century? What about the Excalibur crew from New Frontier or the da Vinci crew from S.C.E. or Klag from the Gorkon? What about the surviving crew of the Stargazer? How was it that Shinzon served the Romulan Empire with distinction during the war, as established in Star Trek Nemesis? And what about the events that were mentioned on DS9 but not dramatized, such as the fall of Betazed from "In the Pale Moonlight" or the Breen attack on Earth in "The Changing Face of Evil"? And so I gathered some of the best Trek prose stylists out there, and set them to the task of sewing some new threads in the tapestry that DS9 provided. Some pairings of author and subject were obvious, e.g., Peter David providing a New Frontier tale, Josepha Sherman and Susan Shwartz -- authors of several excellent novels focusing on Ambassador Spock -- offering an insight into Spock's doings on Romulus during the war years, etc. Some will surprise you; I, for example, chose, for reasons of my own, to tell the story of the fall of Betazed, leaving the able Robert Greenberger to dramatize Klag's adventures. Other authors I just let run loose and tell whatever story they wanted. The result is the book you hold in your hands, one that endeavors to show the entirety of the Star Trek universe. All five television shows are at least touched upon, as are all the above-mentioned prose series. You will see the war from the point of view, not only of Starfleet, but of the Klingons and the Romulans, the Cardassians and the Jem'Hadar, and even that old Star Trek standby, a being of pure energy. Within these pages are battles, disasters, fables, medical thrillers, espionage tales, murder mysteries, and so much more. I must give thanks to the many people who aided me in ushering this book into existence: Jessica McGivney and Elisa Kassin, the in-house editors, who kept the mills grinding. Scott Shannon, the publisher who oversaw those mills. Marco Palmieri, John J. Ordover, and Ed Schlesinger, who kibbitzed marvelously at various points. All the authors, who were true joys to work with, and who were all very patient with their deadbeat editor. Paula M. Block, the wonderful person at Paramount who approves all this stuff, and does so with a keen eye, a fine sensibility, and a marvelous ability to catch things the rest of us are too dumb to notice. And most of all, to the love of my life Terri Osborne, about whom I can't say enough good things, so I won't even try to say them all here.